What’s the big deal about bad neighbors? research is done into exactly where they will be hosted at, who they are registering the domain name through, other sites nearby, and other subtle variables – such as a dedicated or shared server. Many decide to go with the inexpensive hosting provider to save costs, choose an inexpensive domain registrar, and use default packages to get their site rolling, all with little regard on the area they will be residing in. This is much like buying or renting a home with little or no insight into the neighborhood you are about to move into. While usually this can work out with little problem, one can end up moving into a less than reputable area of the Internet. The result can have a negative valuation on your site in many ways, from SEO to unexpectedly being put onto a blacklist due to who you share space with. Much like metropolitan areas throughout the world, the Internet has it’s own rough parts of town. These can include hosting providers who care more about money then their reputation, registrars who do not fully follow the rules set forth by ICANN’s Registrar Accreditation Agreement (RAA), domains that have been compromised without the owners knowledge and are being used for malicious purposes, or, on the flip side of that, known malicious domains hosting nefarious content by the owner for the purpose of infecting visitors computers for various reasons. All of these can affect you or your company’s presence on the web in different ways, and usually not for the better. How does it all connect together? On the outset, your domain name is resolved to a Internet Protocol (IP) address through the use of the Domain Name System (DNS). Without this, you would have to remember a string of numbers every time you wanted to visit a site, and those numbers don’t always stay the same, adding some complication to the process. This usually is not a problem for bigger companies that pay for a dedicated IP, but for smaller budgets, this is not always an option. IP addresses that send spam, host malware, or are Command and Control (C&C) servers for botnets can end up on so called blacklists. When this happens any information sent from them will no longer make it to the intended target and will likely be inaccessible by inbound traffic. This is usually done for the greater good of the users of the Internet, but can be bad if your IP address ends up on one of these lists, even though you have not done anything wrong yourself. Getting your product to customers or message across to readers can become next to impossible if they can not get to you. All of these IP addresses are a subset of a bigger sphere called the Autonomous System (AS). These AS’ are a set of routes that are distributed among network operators so that every computer can talk to every other computer that is reachable on the Internet. Above the AS’ come Autonomous System Networks (ASNs) that are run by ISPs and are registered officially and identify each network on the Internet. These AS’ represent the city in which you are going to live in. For a more detailed breakdown of what an AS is, you can read this OpenDNS whitepaper here. Much like any city, there is always some extent of crime going on. Obtaining an IP address is essentially nothing more than then moving into a region of a city. Depending on the neighborhood, the value of your property will go up or down given what is going on around it. 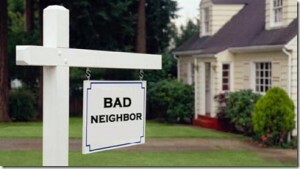 Bad neighbors can greatly cause the value of your property to go down. This is where a little research can go a long way in deciding if you will be affected by SEO page rankings, potential for compromise, getting blacklisted due to someone hosting malicious software on the same server/IP as you, getting a reused IP that once was considered to be dangerous and blocked by numerous companies, and more. Attempting to figure this out all on your own can turn into quite the daunting task. Luckily, I’m here to help you. In my next blog post I will show how some of the powerful tools we use here at OpenDNS can make this task much easier by narrowing down some of the more unruly parts of the web using both Investigate, and our newly released open-source visualization tool, OpenGraphiti.